The composition of the five-component honey bee queen mandibular gland pheromone (QMP) of mated European honey bee queens was compared to those of virgin and drone-laying (i.e., laying only haploid unfertilized eggs that develop into males), European queens and Africanized mated queens. 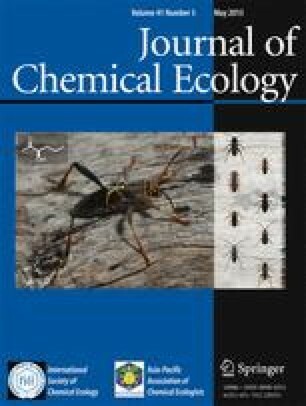 QMP of mated European queens showed significantly greater quantities of individual components than all queen types compared, except for a significantly greater quantity of 9-hydroxy-(E)-2-decenoic acid (9-HDA) found in Africanized queens. Glands of European drone-laying queens contained quantities intermediate between virgin and mated queens, reflecting their intermediate reproductive state and age. QMP ontogeny shifts from a high proportion of 9-keto-(E)-2-decenoic acid (ODA) in young unmated queens to roughly equal proportions of ODA and 9-HDA in mated queens. A biosynthetic shift occurs after mating that results in a greater proportion of 9-HDA, methylp-hydroxybenzoate (HOB), and 4-hydroxy-3-methoxyphenylethanol (HVA) production, accompanied by a decreased proportion of ODA. Africanized QMP proportions of ODA and 9-HDA were significantly different from European queens. A quantitative definition of a “queen equivalent” of QMP is proposed for the various queen types, and a standard queen equivalent for mated European honeybee queen mandibular gland pheromone is adopted as 200µg ODA, 80µg 9-HDA, 20µg HOB, and 2 µg HVA.